Swindon Town have agreed a deal to sign Colchester midfielder David Prutton on a free transfer. The 28-year-old, who only joined the U's in January, has signed a two-year contract with the option of a third. The former Southampton, Nottingham Forest and Leeds United player won 25 caps for England's Under-21 side. "Having seen the team that got to the play-off final I would like to think I can add to it. Its very positive," he told BBC Wiltshire. Prutton linked up with his new team-mates, including fellow recent signing Michael Rose, at Swindon's first pre-season training session on Monday. He already knows goalkeeper David Lucas and fellow midfielder Jonathan Douglas from his time at Leeds and says they played a major part in him deciding to move to Wiltshire. "They said the ethos and atmosphere is great. Good management team, treat you in the right way," he said. "It seems a very refreshing place to come to." Swindon's opening day opponents Brighton also spoke to Prutton and he said: "There were options but when I spoke to the manager and weighed the whole thing up it seemed like a good place to be." Prutton came through the ranks at Forest before moving to the Premier League with Southampton in 2003 for £2.5m. 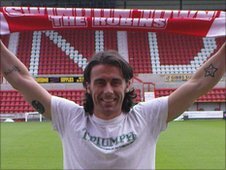 He returned to the City Ground on loan four years later and then joined Leeds ahead the 2007-08 term.